If you need help translating the French instructions, please don't hesitate to contact me! My French is a bit rusty, but should be good enough to provide you with a clear enough explanation! I'm a big shirt dress fan too too but I've found it hard to get exactly the right pattern. I wasn't too keen on the Lisette one from Simplicity. I share your concern about the Hawthorn collar, also the Colette patterns basic shape just never seems to work on me. I'm also very tempted by McCalls 6696, did you see the amazing version that SewAmySew made? It looks like such a versatile pattern. Ooh I think I might have to get on this McCalls 6696 band waggon. I'm still how surprised by how a pattern envelope can go past you and reveal no promise until you see it just pop on someone. Shirt dresses are such a good day to evening. Great summary, I'm just in planning stages of my own for our upcoming summer. Hadn't seen the Serendipity summer or Maria Denmark ones, so thankyou! I think the McCall's one is certainly my favourite, but probably because it's the closest to the classic 1950s shirtdress. It also looks the most versatile. I'm not keen on the Hawthorn, primarily because of the teensy little collar. It doesn't quite seem to sit right to my eyes. The Bleuet is very pretty, and I can't actually see it being too difficult to make. Mind you, I'm never one for reading instructions anyway unless it's something really out of the ordinary, so the French-ness wouldn't bother me anyway lol. Hmm, you've got me back on the idea of a denim shirtdress now. DD had one last year and every time I put it on her I was jealous! I'd love to see you make up Edith- I mean look at those red polka dots would you?!! It screams 'Jane'! 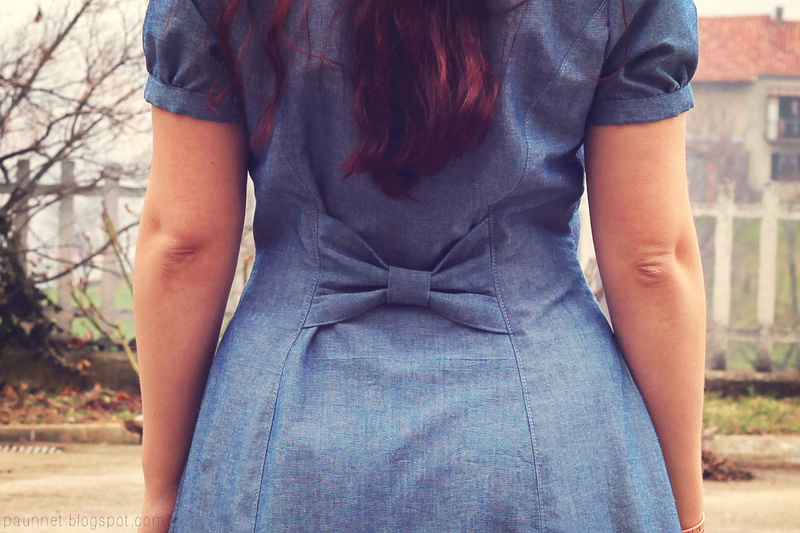 I just finished a black chambray version of the Colette Hawthorn with the three-quarter sleeves - a couple of adjustments were needed to fit the waist but I'm really happy with the result. Know what you mean about the collar, it does take away from the vintage vibe a little. I've looked at the Serendipity dress for about a year now too...nice idea with the pleats. I have a stack of shirt dress patterns on my desk at the moment. 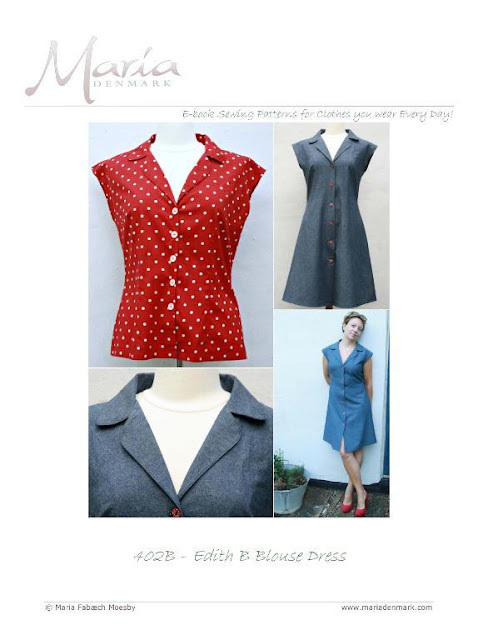 I have made Simplicity 4171 before and love it, I think I need another one, it might be OOP though. I also am thinking about Butterick 5315, Simplicity 2403 or Mccalls 4769. I'm planning on making the Hawthorn with some coloured chambray. I love the bow detail of the Bleute and Edith has that vintage edge......I see an autumn of shirt dresses. I have to admit that I'm with you regarding the collar on the Hawthorn, I'm not a fan to be honest. But shirt dresses in general - I LOVE them and have been wanting to make one for myself for ages. My issue with some of the patterns you mentioned is that I NEED a good waist definition, some of these I'm sure would end up being sack like on me! I also need to get over my fear of buttonholes before I make a shirt dress!!!!! I'm with you on the Hawthorn -I don't like the collar at all. It would put me off making it. Now the sally dress with the pleats - love it. It would also be easy to fit. I have the McCall's 6696 in my to-do list and am looking forward to making it. I have made the Sally dress here at Nessa's Place and it it a breeze to fit to your exact wishes, plus the pattern only has 4 pieces!! Hope you try it! The Edith is so you! Can't wait to see what you decide on - I'm sure it will be stunning (and stretch denim sounds like a winner for autumn/winter). I'm also going through a shirt dress obsession, fuelled by my love of 1940s fashion. I'm making mine from a vintage pattern, Hollywood 1387. I've already made one version and now I'm making a 'Kitty Foyle' dress using the same pattern http://agirlinwinter.wordpress.com/2013/08/19/fall-for-cotton-sewalong/ Shirt dresses are perfect for me because they're smart enough for work without looking too 'dressed up' (if you look too smart at my place, people assume your going to a job interview, or due in court!). Definitely the Edith pattern. I have always loved a good shirt dress and always use red buttons on dark blue or denim. Isn't it funny how it jus seems to work? I have the Sally shirtdress pattern and have yet to make it! I'd love to see your version.Have you seen the Butterick Retro pattern 5920. A little more dressy with an interesting neckline. I made M6696 in the fitted skirt and sleeveless style so it's nice to see what the pleated version looks like! Thanks for the link, I definitely plan to make many more versions of this pattern (as you said, so many variations!). Bonus: it comes with bodice pieces for A/B, C, and D cups. Shirt dresses are wonderful things. I hear you about the Hawthorn collar.. I have made up two different versions of the dress and I've found I'm always reaching for my hawthorn chambray dress because it makes me looked so "put together" on the fly. As much can be said of any good fitting, lovely shirt dress pattern I believe, no? Clare's version is my favorite! I am obsessed with Shirtwaist dresses, too. Do you have Gertie's book? She has one that has elastic shirring at the back, and it's super comfortable. It's like wearing sweat pants in a dress! This is my version of it: http://rosiewednesday.blogspot.com/2013/02/a-magical-sewing-weekend.html. I adore shirtdresses, too, and think they are so flattering on almost everyone. I just finished a shirtdress from an early sixties pattern, and it's already a favorite. They're just so ridiculously comfortable and cute. That last dress is made out of some fabric which is on sale at Minerva Crafts. I wasn't sure about it on the website but now I've seen it made up into a dress I'm quite taken with it! 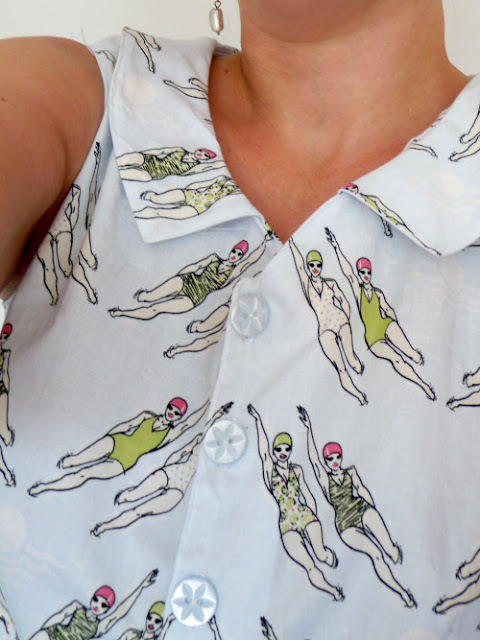 I recently bought some fabric on holiday that is screaming out to be a shirt dress so you're post is perfect timing! I think the Edith would look wonderful on you. Good luck with choosing. Thanks for the recommendations. I also love a shirt dress & there are some I wasn't aware of in your lovely list. Hi Jane, I also love shirtdresses - I have a ton of patterns but haven't got around to sewing them! I adore Clare's it's the bomb! I can't wait to see what you make, you have great taste! Thanks for that Jane, I just went and bought the McCalls pattern!!! In love with it too, Kathryn. I love my shirtwaist dress too. Now that you made a tute for the collar I'm eager to make another one. I am obsessed with a show on Netflix called Bomb Girls. It takes place in the 40's and the clothes are to die for. The show has really good actors in it. I've never made a shirt dress but feel inspired to make one now. Love the Hawthorne collar and that back bow. Thank you for the inspiration and the mention! I'm very tempted to get a hawthorn, seen so many lovely versions around the blogosphere. I also am in love with that back bow detail - so darling! Oh what cute patterns, I love Marie!! That seems SO you. I'm giggling that you said you're obsessed with shirt dresses right now when I feel that's *always* something on your mind, no? ;) I could see you in pretty much each item you showed! 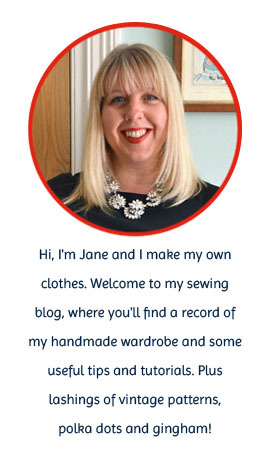 Hello Jane, what a great round up of shirt dresses. I also love them, but so far have only managed a wadder with an out of print McCalls patterns. I do have McCalls 6699...just waiting to get to it. I like the Sally myself...might have to take a closer look at that one! Thank you, there are some lovely patterns here that I hadn't seen before. I love the waist pleats on the Sally, and I don't know how I missed Clare's McCall's dress the first time round but it is absolutely stunning! I already had this pattern on my list after seeing SewAmySew Amy's amazing red version. And I can totally see you in the Edith. Or any of them actually. And I have the English version of Bleuet - if you can't be bothered with translating it I'd be happy to copy the English instructions and post them to you if you email me your address. Ooops, just seen that you have them in English now. Wow, you have some great patterns to chose from there!! Can't wait to see what you will sew. I love the McCall 6696 I think it's really lovely, do you think as a novice it would be to difficult for me to do? This caught my eye other day, only just released this week ! Oh! And a friend of mine from Australia has picked me up a copy of New Look 6587, which I am excited to check out, too! Not sure when that is going to arrive...it is like waiting for Christmas. Sorry...my first comment didn't publish, I don't think. Anyway, I am working on my first shirtwaist, which is McCalls 6891, and although I like it, the whole collar/lapel/facing thing has made my sewing mojo disappear for a bit. Not happy with the end result, but I know where I went wrong, and hope the next one will come out better!! !